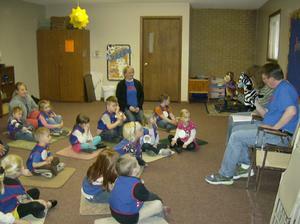 Cubbies is the AWANA Club designed for children who are in the two years prior to beginning regular kindergarten. The Cubbies program features Scripture memorization and basic Bible truths preschoolers can understand. The program materials help parents to actively participate in their child's spiritual development. Because the preschool years are a time of vital development for children, Cubbies encourages parents and club leaders to work as a team in spiritually nurturing children.